The thyroid gland sits over the main cartilage of the larynx and produces thyroid hormone (thyroxine); a hormone that regulates the basal metabolic rate. When the thyroid slows down and fails to make sufficient amounts of thyroid hormone, the result is a condition called hypothyroidism. The symptoms of hypothyroidism are fatigue, weakness, weight gain or increased difficulty losing weight, coarse, dry hair, dry, rough pale skin, hair loss, cold intolerance, muscle cramps and frequent muscle aches, constipation, depression, irritability, memory loss, abnormal menstrual cycles and decreased libido. Human pluripotent stem cells can differentiate into balls of cells that are mini-organs called “organoids.” Unfortunately, if left to themselves, the formation of these organoids is rather haphazard and the cells tend to differentiate into a whole host of different cell types. This is not fatal, however, since the differentiation of these stem cells can be orchestrated by using growth factors or certain culture conditions. Can we use such innovations to make a minithyroid? Darrell Kotton and his group at Boston University School of Medicine Pulmonary, Allergy, Sleep and Critical Care Medicine have spent their time tweaking the conditions to drive human pluripotent stem cells to form thyroid cells. 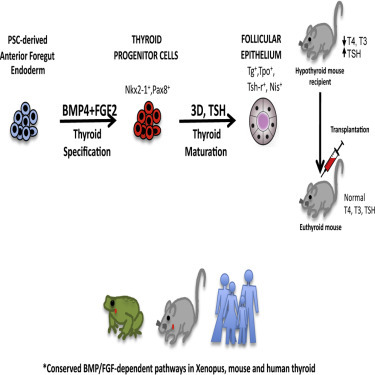 A new study of theirs that appears in the journal Cell Stem Cell details how the use of two growth factors, BMP4 and FGF2 can drive pluripotent stem cells to commit to thyroid cell fates. In order to make thyroid cells from embryonic stem cells (ESCs), Kotton and his group had to make endodermal progenitors from them first. Fortunately, a study from Kotton’s own laboratory that was published in 2012 employed a technique used in several other papers that grew ESCs in a serum-free medium with a growth factor called activin. Christodoulou, C., and others (J. Clin. Invest. 121, 2313–2325) showed that over 80 percent of the ESCs grown under these conditions differentiated into endodermal progenitors. When Kotton and his colleagues cultured these endodermal progenitors in BMP4 and FGF2, some of them differentiated into thyroid progenitor cells. Interestingly, this mechanism by which thyroid-specific cell fates are specified is conserved in creatures as disparate as frogs and mice. To make mature thyroid cells from these progenitors, a three-dimensional culture system was used in combination with thyroid stimulation hormone and dexamethasone. Under these conditions, the cells formed spherical thyroid follicles that secreted thyroid hormone. To perfect their protocols, Kotton’s group used mouse ESCs, but they additionally showed that this same strategy can make mature thyroid cells from human induced pluripotent stem cells (iPSCs). The appearance of cells in a culture system that look like mature thyroid follicles and express many of the same iodine-metabolizing enzymes as mature thyroid cells is exciting, but can such cells stand in for thyroid tissue in an animal that lacks sufficient thyroid tissue? Kotton’s laboratory took this to the next step by transplanting their cultured thyroid follicles into laboratory mice that lacked a functional thyroid. These transplants were not inserted into the neck of the animal, but instead were place underneath the kidney, which is area rich in blood vessels. Interestingly, the implanted thyroid “organoids” or little organs did not fall apart upon transplantation. Instead they retained their characteristic structure. More interestingly, these organoids kept expressing iodine-metabolizing enzymes and made thyroid hormone. The synthesis and release of thyroid hormone was also regulated by the hypothalamic hormone thyroid stimulating hormone (TSH). TSH is made and released in response to insufficient thyroid hormone levels. The thyroid responds to TSH by making a releasing more thyroid hormone, which causes a feed-back inhibition of the release of TSH. The fact that these implanted organoids were properly regulated by TSH bespeaks of the maturity of these cells. Also, significantly, none of the laboratory animals showed any signs that the implanted cells had formed any tumors. Kotton and his coworkers were also able to used human ESCs and human iPSCs to make thyroid organoids. Human iPSCs-derived thyroid organoids were made from human patients with normal thyroid function and from hypothyroid children who carry a loss-of-function mutation in the NKX2-1 gene. This show that Kotton’s system can be used as a model to study inherited thyroid deficiencies. However, there is even more excitement that this system or something similar to it might be useful to safely treat thyroid loss in patients who have lost their thyroid as a result of cancer, or injury.